Even if this might look like it is a lot of work and it requires some skill, trust me, it is actually simple to make. 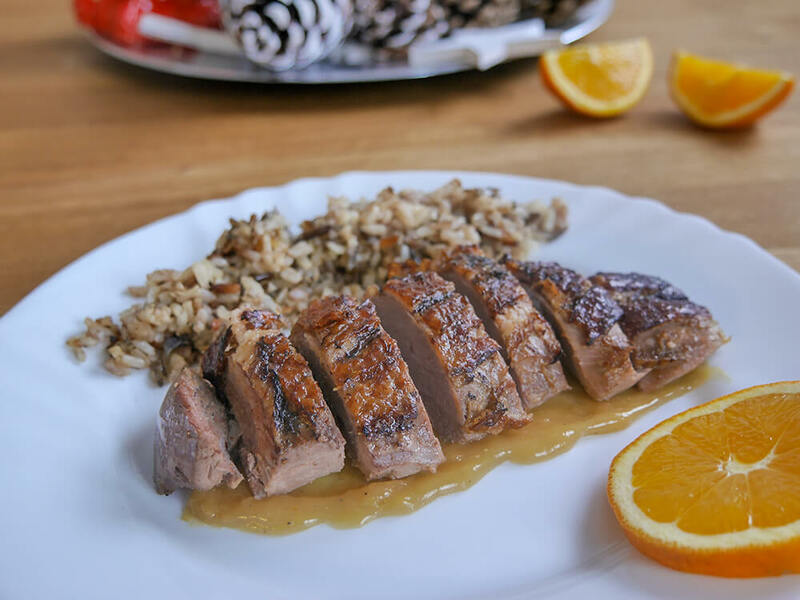 Duck a l’orange might sound fancy and intimidating, but the truth is that with a bit of preparation you can easily make this and enjoy the most savory meat ever. Seriously, the end result is absolutely amazing! The meat is super tender and as a bonus, you get to save up duck fat for future dishes that will blow your mind. It is a perfect dish for Christmas and New Years Eve or whenever you have a few guests over. I used 2 ducks, one slightly larger than the other, but both medium-sized (5 to 6 lb / 2.2 to 2.7 kg). These 2 ducks can serve 8 to 9 people with a good appetite. I made this by firstly marinading them overnight in a large 19-Inch Granite Roaster like this one. This roaster with lid is incredibly useful for large pieces of meat. I use it for wild meats where the marinade is a must, to bake large turkey and vegetables or even pork chops. In this case, I marinaded the ducks overnight in the pot and cooked them both in the lid. The roaster is something that I wholeheartedly recommend to anyone who appreciates utility in the kitchen. So, an important step for this recipe is the marinade. Please see below the whole recipe and steps I used. Thaw the 2 ducks overnight in the fridge if they are frozen. For the marinade, place the ducks in a big roasting pan ( I used a 19-Inch Roaster with lid) and add the orange juice, garlic, soy sauce and orange marmalade. Put the lid on and place them in the fridge for at least 8 hours. Take out ducks and save the marinade for the sauce and basting sauce. Score ducks lightly with a knife. This will help make the surface crispier. Make sure you do this carefully, so you don´t pierce the meat, as this will dry it out. Place both ducks breast side up closely in a shallow roasting pan. If you have a 19-Inch Roaster, place them directly in the lid of the roaster. Drizzle or spray a little bit of olive oil on the duck and rub its surface with salt and pepper. Boil the rice according to your package instructions. Add 1 Tbsp Butter when ready and mix. Stuff ducks with the cooked rice. Place them in the oven at 350° F (180 ° C), uncovered, for 1 hour. For the basting sauce, take the orange juice marinade from the duck and bring it to a boil, in order to make it safe to eat. Save 1/2 cup of the boiled marinade to baste the ducks. Set 1/2 cup aside for the sauce. Take ducks out and pour out the duck fat that you have in the pan or lid into a heat-resistant dish. You can save this in the fridge or freezer for later and add it to your future dishes, as it gives a great taste. Mix 1 Tbsp of the duck fat with the 1/2 cup of marinade and baste ducks. Place ducks back in the oven for another 1 Hour and 40 Minutes at 350° F (180 ° C). It normally should not burn, but check it and if does, cover the lid with foil. For the sauce, in a small pan, combine the marinade, add the water, cornstarch, orange marmalade, salt and pepper. Mix all on medium-high temperature until the sauce thickens, for about 1 to 2 minutes. Blend the sauce to get a smooth texture. Serve it with the duck and rice.